You may think weeds resistant to herbicides are a new phenomenon linked to the overuse of glyphosate in genetically engineered crops, but according to the Weed Science Society of America (WSSA) nothing could be further from the truth. This year marks only the 20thanniversary of glyphosate-resistant crops, while next year will mark the 60th anniversary of the first reports of herbicide-resistant weeds. The first known report of herbicide-resistance came in 1957 when a spreading dayflower (Commelina diffusa) growing in a Hawaiian sugarcane field was found to be resistant to a synthetic auxin herbicide. One biotype of spreading dayflower was able to withstand five times the normal treatment dosage. That same year wild carrot (Daucus carota) growing on roadsides in Ontario, Canada was found to be resistant to some of the same synthetic auxin herbicides. And that’s true. But the history of herbicide resistance actually goes back even further than that. There is evidence that individual weeds resistant to herbicides existed long before we even discovered synthetic herbicides. 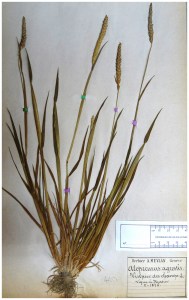 French researchers screened herbarium specimens for a weed called blackgrass (Alopecurus myosuroides). They then tested those blackgrass specimens to see if any of them carried genetic mutations known to confer resistance to a certain type of herbicide (ACCase inhibitors). They found a mutant collected in 1888 near Bordeaux, France and kept at the Montpellier herbarium that had the same kind of mutation that causes herbicide resistance in blackgrass today. The study was published in PLOS ONE in 2013. Herbicides that inhibit the ACCase enzyme were not commercialized until the 1970s, which means that the herbicide resistant plant in the French study was collected over 80 years before the herbicide had ever been sprayed. Although it is a really cool study, it isn’t actually surprising based on what we currently know about herbicide resistance. Weed scientists have long suspected that spraying herbicides doesn’t cause resistance mutations to occur in the plant; it simply removes all of the susceptible plants so that any plants that are resistant can grow and survive. Over time, continued use of the herbicide selects for the resistant plants to become more common, and to eventually dominate the field. Herbicide use selects for the resistant plants that occur naturally within a weed population. The PLOS ONE study shows pretty convincingly that the resistant plants have been out there for a very long time. And if we continually spray the same herbicides, we’ll eventually find them all! Next Article How much yield is enough?